This cabinet was designed as an embroidery cupboard, with many shallow shelves. The doors are decorated with the symbols of the Zodiac, painted by George McCulloch . The choice of oak, the simple design and the modest use of decoration seen here are all features of Arts and Crafts furniture. The designer, Lewis Foreman Day (1845-1910), was extremely keen on embroidery and published articles and manuals on the subject. He was one of the most commercially aware and successful designers of his generation. He is best known for his textiles, ceramics and wallpapers, and for his writings on the philosophy of the Arts and Crafts Movement. He had a strong relationship with the V&A and the art school attached to it, and the Museum owns a large collection of his designs. Oak, inlaid with ebony and satinwood decorated with painted panels of the signs of the Zodiac executed by George McCulloch. 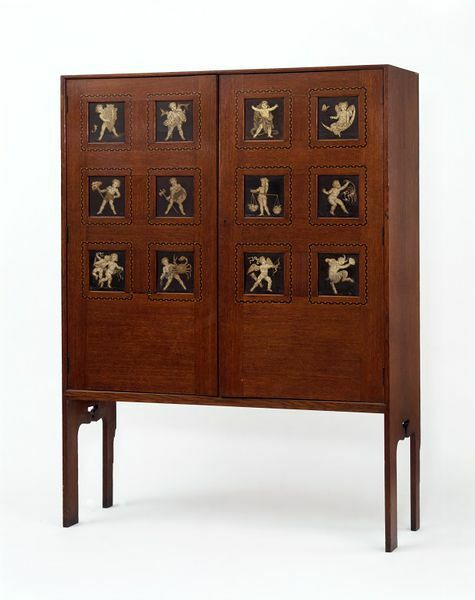 Designed by Lewis F. Day as an embroidery cupboard in 1888. Exhibited at the Arts and Crafts Exhibition 1888. 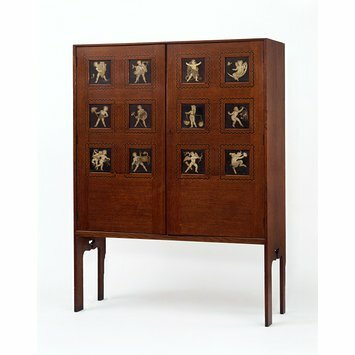 Designed as an embroidery cupboard. Karen Livingstone and Linda Parry, eds., International Arts & Crafts (V&A: V&A Publications, 2005), p.51.